Our staff work hard to give our customers the confidence needed for the best experience possible. We want them to have a unique, safe, memorable and fun adventure. New Hampshire Magazine and their readers have named Alpine Adventures the Best of NH Zipline for 2016. “We are honored to receive this award again,” said Jeb Boyd, CEO of NLI Entertainment who owns Alpine Adventures in Lincoln NH. “Our staff work hard to give our customers the confidence needed for the best experience possible. We want them to have a unique, safe, memorable and fun adventure. Their commitment to delivering a world class adventure experience for every guest is the reason for this award.” Alpine has received this award six out of seven years, more than any other zipline destination in the state. Alpine Adventures is the first, largest and most award-winning zipline and adventure destination in New England, with three separate zipline courses, off-road tours, aerial adventure park, BigAirBag Stuntzone and backcountry snowshoe tours. It is widely known for superior guest service, unique outdoor family adventures, and new and innovative activities for visitors to the White Mountains and beyond. Located in Lincoln/Woodstock, the Basecamp of the White Mountains, Alpine Adventure’s 300 acre mountain playground is surrounded by spectacular scenery, plentiful lodging & dining options, making this one of the top year-round destinations in the state. NLI Entertainment has built a reputation of creating unique experiences and a commitment to exceptional customer service with all of it’s adventure destinations. In addition to Alpine Adventures, NLI also operates Whale’s Tale Waterpark which has been named one of TripAdvisor’s “Top 25 Water Parks in the U.S.” The newest addition to the NLI Entertainment family is Candia Springs Adventure Park in Candia, NH which opened this summer with an all-new, state of the art aerial adventure park. For more information on Alpine Adventures, visit online at alpinezipline.com, visit them on Facebook or call (603)-745-9911. To find out more about all of the NLI properties, please visit NH-Fun.com. 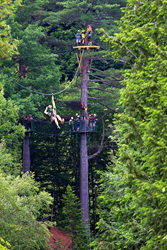 Alpine Adventures - New England's Most Award Winning Zipline & Adventure Destination!